The Way Animals Are Slaughtered For Muslim Holiday Raises Fears Of Crimean-Congo Hemorrhagic Fever : Goats and Soda The way animals are transported and slaughtered for the major Muslim holiday has health officials concerned about the threat of Crimean-Congo hemorrhagic fever. 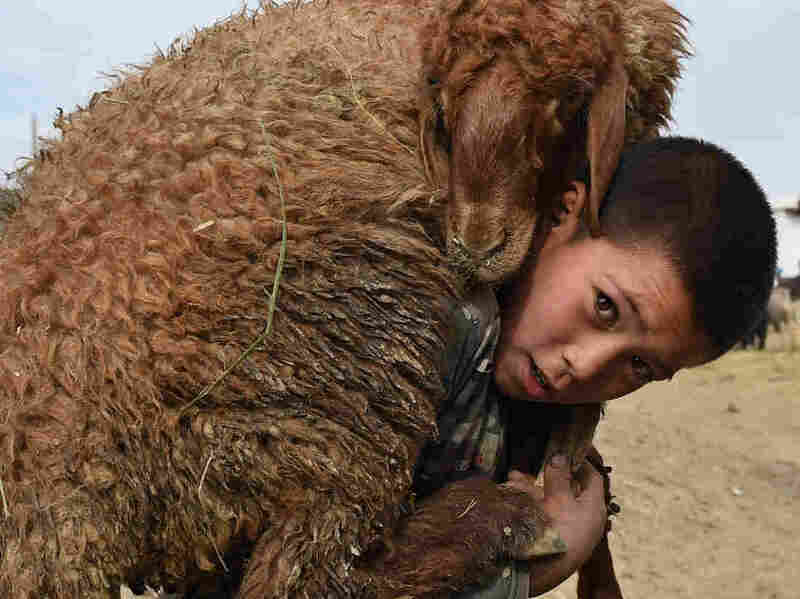 An Afghan boy carries a sheep on his shoulder at a livestock market on September 22, 2015, just ahead of the Eid al-Adha festival in Kabul. In a large swath of the world, animals, including cows, sheep and goats, can carry a nasty virus: Crimean-Congo hemorrhagic fever. They get it from ticks. The animals don't show symptoms, but if a person gets the virus it can make them really sick, with a headache, fever, severe bruising and bleeding. Up to a third of patients die, usually within two weeks. There's no vaccine for people or animals, and although an antiviral medication has shown promise in studies, the only proven treatment is supportive care. Afghanistan's health ministry reported 66 confirmed human cases of the virus this year; 12 of the patients died. Other countries at high risk include Turkey, Iran, Tajikistan and Pakistan. Each year, Bulgaria reports about ten cases. Between 2002 and 2015, Turkey reported almost 10,000 cases. But in many places, it's hard to get reliable numbers. People can pick up the disease if they're bitten by an infected Hyalomma tick or if they come into contact with the blood and organs of an infected animal, particularly during slaughter. And, as with Ebola, people can pass the virus to each other through contact with infected bodily fluids. Studies have shown that during Eid al-Adha, opportunities for people to pick up the virus from animals, or from their ticks, go way up. Around the holiday, a lot of animals are transported and traded, sometimes across borders and often from rural areas to urban ones. That makes it easier for other animals, like rodents or pets, to pick up the virus. And the mingling of livestock can also introduce new variants of the virus. The way animals are slaughtered on the holiday adds to the risk. In many countries, official slaughterhouses offer safe ways of handling the animals. But during Eid al-Adha, some celebrants opt to slaughter the animals on their own or hire a non-professional butcher to kill the animal on the roadside or in a backyard. So there's less regulation over animal sales. Livestock might not be treated with the insecticides necessary to kill ticks. And people may not follow health precautions during slaughter. Some researchers predict that cases of the virus will rise in Muslim countries over the next decade because Eid al-Adha, whose dates shift each year, will fall during the summer, when ticks are most prevalent. "We urge everyone to take necessary preventive measures as they slaughter animals during the holy Eid al-Adha holiday to protect themselves and their families from this virus," said Dr. Ferozuddin Feroz, Afghanistan's Public Health Minister, in a statement published this week by the World Health Organization. The WHO recommends that butchers use gloves and protective clothing to avoid touching bodily fluids that might be infected. They also suggest wearing light-colored clothing, so it's easier to notice if a tick hops onto them. As for caring for a suspected patient, the recommendation is to act as if they had Ebola or Marburg, two other hemorrhagic fevers. It makes sense that countries including Afghanistan would be worried about the virus, says David Pigott, a spatial epidemiologist at the University of Washington who published a database of CCHF cases going back to 1953. "There was an outbreak in 2000 and it was linked to exactly this festival, with livestock being sacrificed on the streets or roads — not the most hygienic of settings," says Pigott, citing a paper from Pakistan. Before 2016, most cases in Afghanistan came from western districts. Now, they're showing up in other areas. The disease is also popping up in places where it hasn't been a problem before, likely due to climate change that's expanding the tick's range. Last month a man in Spain died of the disease, and he appears to have infected a nurse while in intensive care at a hospital in Madrid. The patient, the first to pick up the disease while in southwestern Europe, noticed "a tick bite after a walk in the countryside." The second patient was reported Friday to be in a serious but stable condition. The cases have given people enough of a scare to appear at the top of this week's summary of public health threats by the European Center for Disease Prevention and Control. And the Madrid Health Service reported this week that it's now monitoring about 280 people who came into contact with the patients. "Historically, Spain has been considered as non-endemic," says Pigott. "And then over the last five years or so, there's been evidence to suggest there could well be a northward expansion of the CCHF virus into a variety of other places, not just in Spain but across southern Europe," he says. Earlier this year, Tom Frieden, director of the U.S. Centers for Disease Control and Prevention, said the tick-borne virus was "much more widely distributed than anyone knew before." The virus is endemic in Africa, the Balkans, the Middle East and parts of Asia. An international group of scientists wrote last year that Crimean-Congo hemorrhagic fever is "the most widespread tick-borne disease of humans" and that cases have increased in the last decade, particularly in Turkey, Iran and India. A previous version of this post incorrectly said that the Festival of Sacrifice marks Abraham's willingness to sacrifice his son Isaac. In fact, in the Islamic tradition, the holiday commemorates his willingness to sacrifice his son Ishmael.